Over the past few days, after Chris has done his business in the bathroom he says: “Ah, how I missed nice toilet paper.” Oh how I know what he means. In China no matter where you were: a hotel, business, restaurant the toilet paper was tissue paper-thin. Actually thinner than tissue paper. Which baffles me because then you just need to use more of it. Most of the time it was one-ply instead of two-ply. So is two-ply toilet paper more of an American thing? We saw a commercial this weekend for Scott toilet paper. Their Natural Tube-Free toilet paper. What a concept. The ad says that every year the US throws away enough toilet paper tubes to fill the Empire State building — twice. You then see an Empire State building made of toilet paper rolls. A good ploy for those that are environmentally savvy enough to care about the tube leftover. I am not saying I do not care, but I have to say this house is more picky about the paper on the roll! Let me just say that when there was toilet paper it was thin, but my bathroom experiences were vastly different. My bookstore experience was probably the most primitive. Most other bathrooms where more mainstream. My hotel lobby bathroom was well in another era. When I first saw this contraption in the bathroom stall I at first thought it was more bidet-like, and realized these were just the flushing options for the toilet. Pulsating, front cleansing, rear cleansing, drying (click the photo to see it larger). Quite the experience. This was for lobby guests only, they did not give hotel guests the option to test out the features in our room. Although I did have a telephone. Not sure these days who would use a telephone in the bathroom, I mean we have iPhones for that. 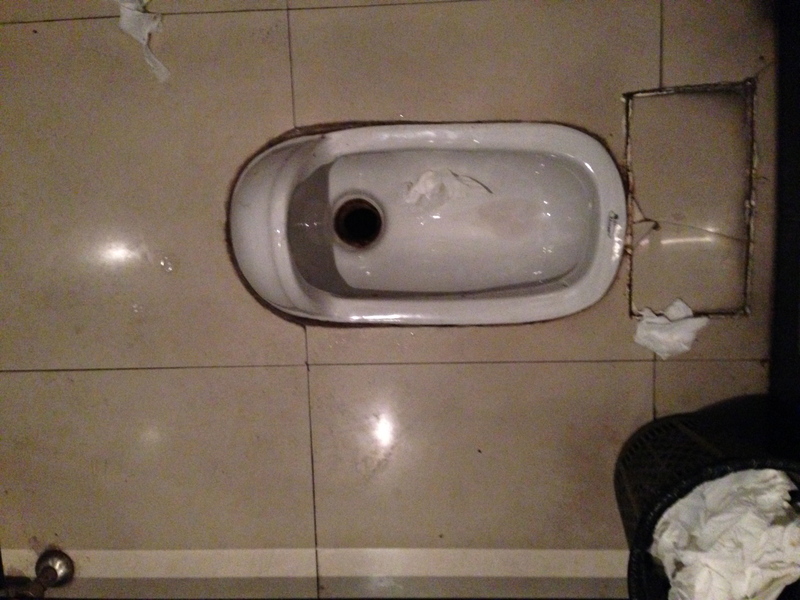 The last interesting bathroom adventure while in China was in a restaurant bathroom. 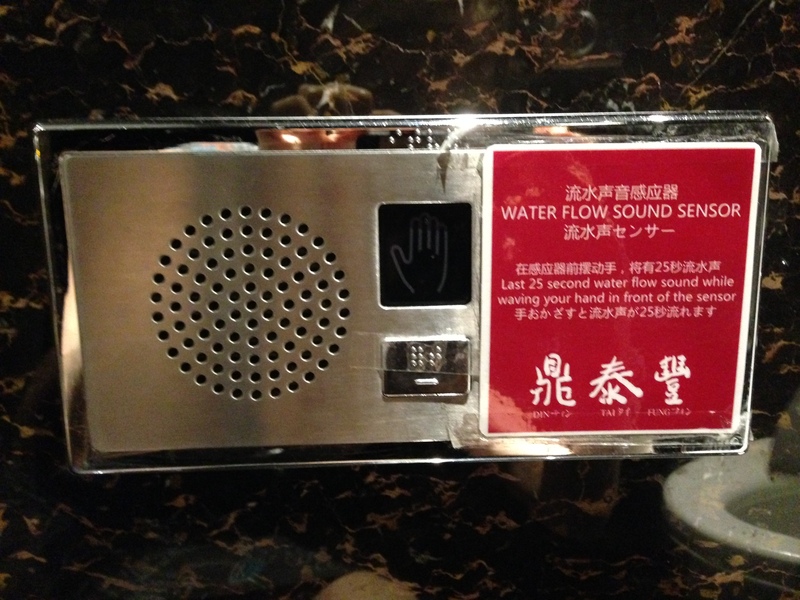 Each stall had a “water flow sound sensor.” I was especially intrigued by this due to the nature of our conversations at work about bathroom etiquette. 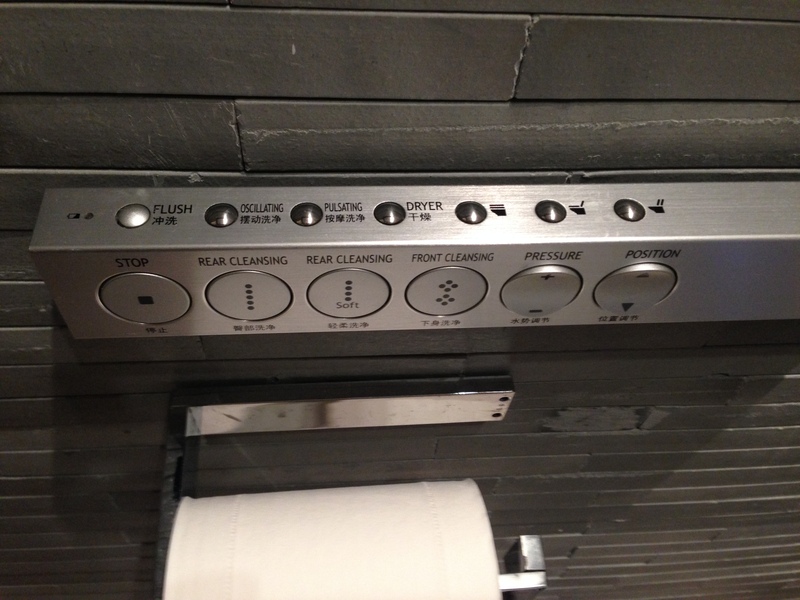 When you pushed the button, it made the loudest flushing sounds and would do it again if you pressed the button again. It took me a bit to figure out that the sounds were meant to cover whatever noises you were going to make while using the commode. What is not to like? The world works in mysterious ways especially pertaining to toilet paper, toilets, and flushing.